Not all amps are suitable for practice and we can testify from experience that there's nothing quite as heartbreaking as losing all the vibe of your expensive tube amp because the volume is so low. While many of you may simply choose to engage in a war of sound with their neighbour, or better yet, pick up an attenuator to drop your level but maintain your tone, don't forget about perhaps the most obvious option, the humble practice amp. Now, there are an absolute wealth of options available to you, including compact models such as Fender's Mustang V2 Combo and the acclaimed Yamaha THR10, but today we wanted to draw your attention to a model with a bit more punch that's currently on offer at an absolute bargain price; the DV Mark Guitar Friend 12 112 50W Combo. 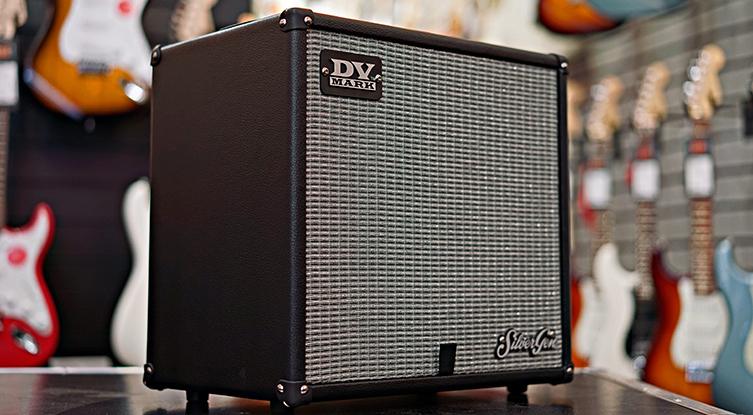 Fairly compact and lightweight, but sturdy enough to still feel like an amp you can rock out on, the DV Mark Guitar Friend 12 is a great choice for players looking for a reliable at-home solution that they could also take on the road. Featuring both a clean and a lead channel, these amps are plenty loud for home use, bringing a lovely chimey clean tone to the table that we instantly fell in love with. Offering bags of clarity and giving you a full sound that you'd swear came from a much bigger amp, there's a fantastic character to the DV Mark Guitar Friend 12 and its clean channel really does sound exceptionally good for its price. That's not to take anything away from its drive channel though, which gives you everything from a slight edge to full on high-gain chunk and sounds every bit as full and rich as the clean channel. Not only that, this amp was designed to interface well with most pedals and in our experience, it has more than lived up to that claim. We put it to the test alongside a number of different drives and found the Guitar Friend 12 responded well to all of them. We also had absolutely loads of fun experimenting running some of our favourite delays through its clean channel and would wholeheartedly recommend it to any effects heads who require a blank page to paint their sound onto. However, it's not just the sound of the DV Mark Guitar Friend 12 that we think makes it a great value piece of kit. It also features an AUX input which allows you to play along to your favourite tracks, again making it an excellent practice amp. Its controls are as you'd expect with a 3 band EQ and a built-in reverb that really lets the amp sing on its clean channel. Also sporting an XLR Line Out so that you can plug into a PA system, these no-frills amps have ticked all of the boxes for us. An awesome choice for home practice with the flexibility, power and fullness to follow you to a small gig, we can't believe the value for money that the Guitar Friend 12 offers. On the whole, these amps are very user-friendly and perfect for those in need of a no-nonsense amp that doesn't break the bank. We only have limited stock at this price, so if you feel like the Guitar Friend could be the choice for you, pay us a visit to try one out before you miss your chance!